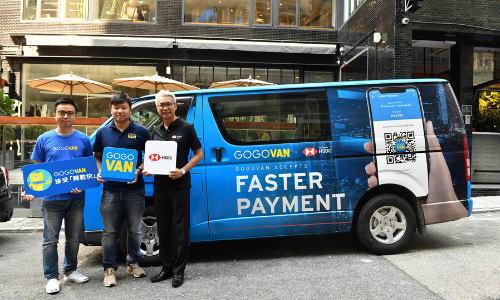 Logistics mobile app platform GOGOVAN has partnered with HSBC to offer Faster Payment System (FPS) service, aiming to increase its market share by offering a more convenient payment method. Since its inception in 2013, GOGOVAN has been allowing its individual customers to pay by cash only, causing difficulties for drivers to give the change. Under the new partnership – free for all GOGOVAN users and its network of more than 40,000 registered drivers – customers can choose to pay by FPS when placing an order. After arriving at the destination, customers just confirm the final fee with the driver and scan the QR code, which could be finished in only 10 seconds. All registered drivers can earn $50 bonus for every completed FPS order in October this year. It’s expected this promotion will cost up to more than one million dollars. After attracting the drivers, Kwan told Marketing that the company will roll out a marketing campaign for customers but currently there’s no time frame and details. Last year, GOGOVAN provided GOGO Business for SMEs to consolidate cash payments to drivers. Following this, the new door-to-door service GOGODELIVERY rolled out this summer, accepts credit card payments up front, also driver accounts have just been equipped with the capability for electronic top-up, making the order taking process easier and quicker. Kwan concluded that as e-payment has become increasingly popular, GOGOVAN will continue to explore various payment options to provide faster and more convenient services, while also strengthening its position in the industry. Continual innovation, increased revenue from advertising, and growth in its cloud business helped this brand come out on top. ..
Hong Kong's Pure Group yesterday unveiled its vision of a connected, game-led future of fitness, with technology and experience at.. This comes following a pitch, where Lazada was looking for an agency to grow “several commercial categories and hitting key object..